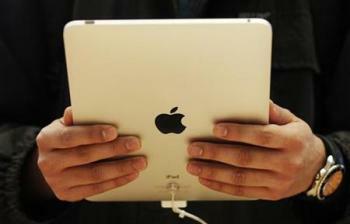 Record sales of iPhones and iPads resulted in record profits at Apple in the final quarter of 2011. Apple more than doubled its profits: to $13.06 billion compared with $6 billion for the same quarter in 2010. Chief executive, Tim Cook said he was thrilled the company sold a record 37 million iPhones in the final quarter of 2011, a 128 per cent rise on a year ago. “We could have sold more if we’d had more supply,” he said. The recently launched iPhone 4S proved to be the company’s best seller in the quarter. We could not be happier,” said Cook. In record sales across nearly all product categories, Apple sold 15.43 million iPads over the quarter, more than double a year ago. It sold 5.2 million Macs during the quarter, a 26 per cent unit increase. Only sales of iPods fell, down 21 per cent year on year to 15.4 million; however, Apple has enjoyed higher average selling prices as consumers buy more of the iPod Touch.